Born October 2, 1935 in Chicago, Illinois. Robert H. Lawrence, Jr. was the first African-American astronaut. He earned a bachelor’s degree in chemistry from Bradley University at only 20 years of age and a Ph.D in physical chemistry from Ohio State University. Lawrence and his wife, Barbara Cress Lawrence, have one son, Tracey. 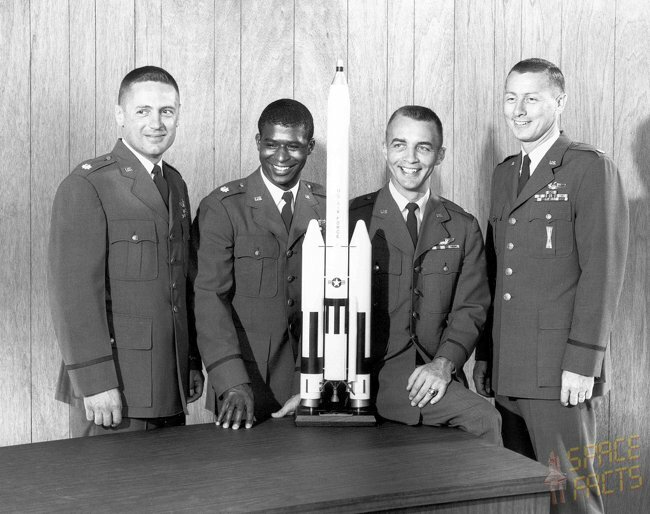 Major Robert Lawrence was an Air Force test pilot assigned to the Manned Orbiting Laboratory Program (MOL). The MOL Program was a predecessor of NASA’s Space Shuttle Program and the two programs eventually merged. The space agency cited Lawrence for accomplishments and flight maneuver data that "contributed greatly to the development of the space shuttle." Robert Lawrence logged more than 2,500 flight hours during his career. His Air Force honors included the Commendation Medal and the Outstanding Unit Citation. Major Lawrence perished in an F-104 Starfighter crash at Edwards Air Force Base, California. Robert H. Lawrence, Jr. made the ultimate sacrifice and lost his life in service to the nation and the space program on December 8, 1967.